Entrusting the management of your business financials is not something many people find easy. Who do you trust? Who can you rely on? How do you know if you are choosing someone that best fits your business? Not all bookkeepers are created equal, so how do you sort between the milk and the cream of the industry? There are few factors to take into consideration that can help steer you in the right direction – but remember to always meet with your prospective bookkeeper to ensure you are compatible and can work together. The relationship you have with your bookkeeper should be a clear one and with an open line of communication. 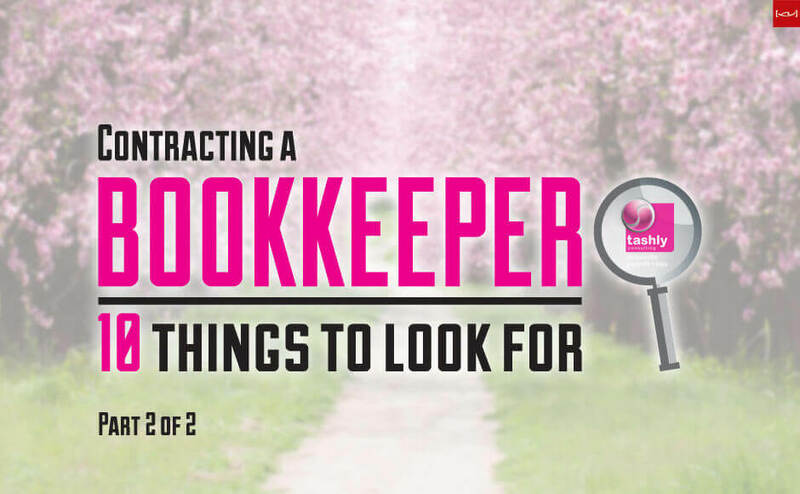 If you are starting out looking for your first bookkeeper, or perhaps replacing and old one, consider some of the following points. 6. Are they a Registered BAS Agent? Does your bookkeeper embrace technology? Do they use current or cutting-edge tools and software available to them to run your bookkeeping processes as efficiently as possible? Are they open to looking at new ideas which may be beneficial to your business? Most accounting software companies have partner programs available to bookkeepers and accountants and provide prioritised support and training opportunities to them. Some bookkeepers may choose to become a specialist in one particular software, and others may choose to be proficient in a few. It would be beneficial if they can provide some assurance around their ability to use the software, and most software companies do provide a certification process before allowing a partner to advertise their alliance to that company. Critical to the success of all businesses is the existence of adequate and reliable systems and processes. Perhaps this might actually be an area in your business you recognise as requiring some improvement and a great bookkeeper will assist you in integrating good bookkeeping systems into your business. Systems around processing of sales, recording expenses, capturing receipts, processing payroll and preparation of reports are just a few to mention. It goes without saying, that the greatest of systems and procedures won’t work if the key stakeholders in the business don’t comply – so it becomes a team effort and can be a process of evolution. Ask an incoming bookkeeper what systems they can bring in with them and discuss how they can be implemented into your business. Bookkeepers are generally known for their attention to detail. This can sometimes be a point of difference between an average bookkeeper and a great bookkeeper. With bookkeeping, ‘near enough’ generally isn’t good enough – particularly when the tax auditor is sitting at your boardroom table reviewing your figures. Many entrepreneurs are ‘big picture thinkers’ and may find the bookkeeper’s attention to detail trifling and sometimes irritating – however this will lay a strong foundation for your business. Big picture thinkers need to surround themselves with ‘details’ people and your bookkeeper should be one. Ensure your bookkeeper pays attention to the details and prides themselves on a high level of accuracy. The bookkeeping industry is a profession – not dissimilar to accountants, lawyers or architects. Look for a bookkeeper who acts professionally. Existence of engagement letters, checklists, and regular and open communication with you as the business owner is important and sets a certain level of professionalism into your relationship. Professionalism also embodies attributes of reliability, good communication, honesty and integrity. Sometimes there may be someone a bit cheaper who cuts these corners, but you may find that the job you are paying for is also cheap with corners cut. It goes without saying that confidentiality is absolutely paramount. Feel free to ask your bookkeeper to sign a Confidentiality Agreement before engaging them. Your business intellectual property and financial position are not the business of others, and appropriate signed authority documents should be sought from you by your bookkeeper before any information is distributed to others by them. Clear communication needs to be in place setting out guidelines of who your bookkeeper can discuss your accounts with and may include key personnel and your accountant. Engaging a bookkeeper is an important decision, and not one that should be rushed into. Take your time to find the right fit, and remember that sometimes you get exactly what you pay for. Price may be a factor, but shouldn’t be the most important one. If you are purely shopping on price, you may miss out on getting the exact right person for your business over a few dollars – which could be more than saved if your less adequate bookkeeper takes longer to do the work or makes a mess and more fees are to be paid to another professional to fix up the mess. Seek referrals from your business networks whether they have appropriate bookkeepers they work with or can recommend and ask for testimonials or recommendations from the incoming bookkeeper. Your relationship with your bookkeeper is an important one, and can be pivotal in your business success – so choose wisely. Tashly Consulting Xero Bookkeepers Adelaide are Registered BAS Agents #86318001 and we are dedicated to providing seamless, high-quality, transparent bookkeeping services – If you would like any further information please contact us via telephone (08) 8121 4424 or via email. Tashly Consulting Xero Bookkeepers Adelaide – Not your average Bean Counter!